Posted June 17, 2015 by Andler Dental & filed under Dental Articles, Dentistry. The next best thing to an actual toothbrush is probably a thick paper towel. The texture of paper towels allows you to scrub your teeth and rid your mouth of harmful plaque and bacteria, without causing damage. Simply wrap a paper towel around your finger, place a dollop of toothpaste on it, wet it, and start cleaning. It’s best to start with a little toothpaste and add more if needed. Don’t forget about the backs of teeth, chewing surfaces, or tongue. When you’re finished, rinse well. If you’ve forgotten both your toothbrush and your toothpaste, don’t panic. There’s an easy trick you can use temporarily to get your mouth pretty clean. Start by washing your hands with warm water and soap. You do not need to dry them as you’ll need a wet finger for the next step. Simply take a damp finger and start to rub each tooth individually. Repeat this process on the backs of the teeth as well as the chewing surfaces. It may be necessary to rinse your finger after a few teeth so you don’t transfer bacteria from tooth to tooth. If you have a soft washcloth or paper towel on hand, dampen it and follow up your finger cleaning with a gentle scrub. Rinse well and repeat if your teeth still don’t feel quite clean enough. If water alone doesn’t seem to cut it, you can always try to make your own toothpaste replacement. A little bit of salt dissolved in about eight ounces of water can serve as a gentle abrasive to clean your teeth. Salt also naturally has antibacterial properties which may help eliminate some damaging bacteria. Once you mixed the concoction, you can either dip your finger into it and scrub away, or use a paper towel. Baking soda may also help. Just dip your wet finger or paper towel directly into it and start scrubbing away. If you find the baking soda to be a bit gritty, you can mix some into water and use that instead. 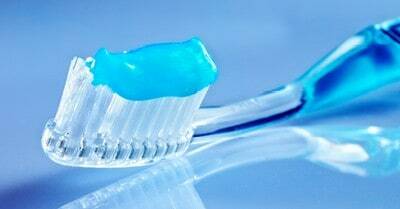 The next time you find yourself without a toothbrush or toothpaste, follow the tips above. You may find one works better for you than another, but as long as you’re clearing away the bacteria, your chance for decay and other dental problems may decrease. As always, maintaining regular appointments at my dental office in Madison is crucial for optimal oral health. Welcoming patients from Madison, Middleton, and Verona.